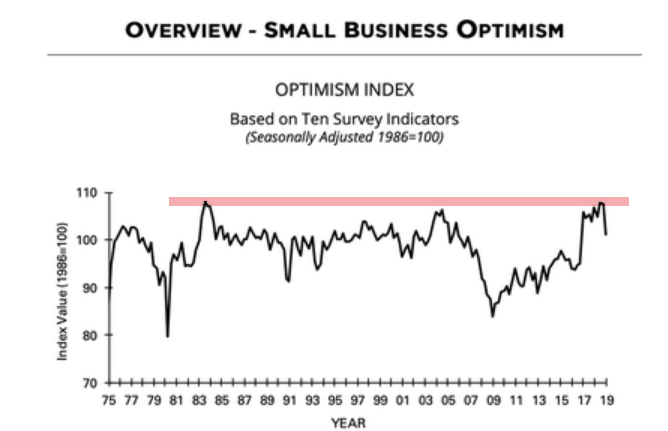 US Small Business Optimism is sky high – is it too high? Long time readers know that I place great store in measures of sentiment both in each specific market and in the wider economy. That is simply because it is the waves of sentiment that drive the financial markets according to the Elliott Wave model. While I have access to several reliable market sentiment indicators, those in the economy are far less numerous or reliable. But one that I like is the Small Business Sentiment Indicator (SBSI). Hiring, hiring plans, and job openings remained strong. Inventory spending and capital spending were solid. Owners expressed concerns about future sales growth and business conditions later in the year. There was some deterioration in conditions that would support business expansion. The point to note is that the surge to last year’s high matched the two previous highs in 1983 and in 2004 at the 110 area. Evidently, the 110 reading is the maximum positive mood achievable by small business owners – and represents the very best conditions before they deteriorate. Incidentally, if there was such an indicator for the UK, I am confident it would show even greater emerging negative mood given the growing Brexit problems as we head into the March 31 deadline. At least, the US does not suffer from that little worry. Note the peak in 2004 – three years before the peak in the stock market in 2007 just head of the Credit Crunch. With this major lag, the SBSI indicator is not necessarily a great tool to time any stock market high. But unless history can be made, the now weakening sentiment will only be a drag on stocks this year. This is about as good as it will get for small businesses. And with the Trump tax cuts wearing off and interest rates on the rise again, I do not believe it will be another three years before the Dow tops. 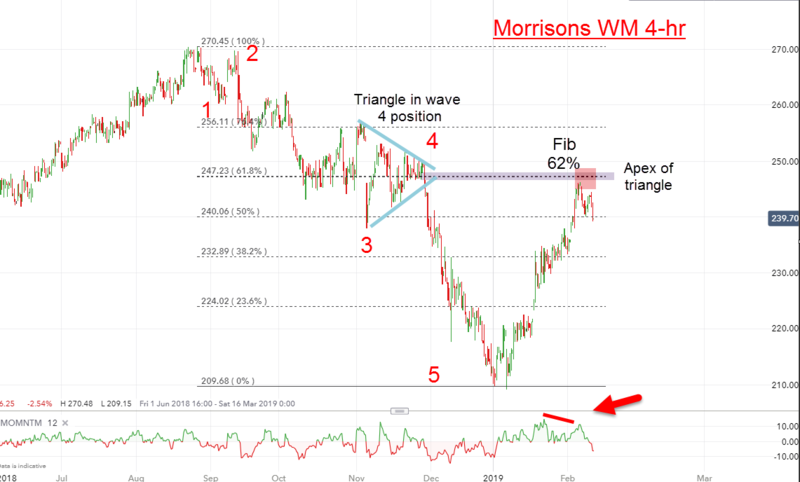 We are trading Morrison WM Supermarkets for PRO SHARES members. This is one of the UK’s Big Four supermarket chains and is considered a ‘defensive’ share. It is believed to hold up better than ‘growth’ shares in a downturn (a belief that will surely be tested this year). It doesn’t trade like a penny share (to put it mildly),and is rather stately – but that is an great advantage for traders who shun the thrills and spills of some of the violent tech shares for a more conservative vehicle for making profits. If spread betting, then taking a 30p – 40p profit per share on a small £25 per pip bet would produce a gain of £750 – £1,000 – very welcome especially for the smaller accounts. I had noted the rally off the Christmas lows in common with many shares. The decline to those lows off the summer high was in a clear five, and thus I expected a relief rally in a three. That is the Elliott Wave rule. And since most relief rallies carry to the Fibonacci 62% region, I forecast a push up to the 246 area. And then a turn back down. That was the level I wanted to put out some shorts. That would be a very low risk trade since I could then set a close stop loss. And lo and behold, the rally carried right to my target level on the nose. But the Fibonacci 62% retrace was not the only source of resistance at 246. There was more. On the way down, wave 4 was a clear triangle pattern. Triangles in wave 4 usually lead to a final thrust in wave 5 and then a sharp reversal back to the area of the wave 4 high, which it did. Not only that, but the extension of the triangle apex is another common line of resistance. Finally, I have a small bearish momentum divergence at the high. So I have at least four valid reasons to suppose the 246 level would be the high of the relief rally. That is about as good as it gets for a Tramline Trader! Has the dollar finally turned? As you know I have been waiting for the dollar to reach a major top and I believe it has finally made it yesterday. Take a two-week Free Trial to my VIP TRADERS CLUB to discover what plans I have for our multi-month campaign. And discover what plans I have for MORRISONS WM and many other campaigns – take a three-week Free Trial to my PTO SHARES service.